Home » PIllows » Satori Buckwheat Meditation Pillow: Is it Best for Posture Support? What makes an excellent meditation pillow? Should it just be about support? What about comfort? It is actually a mix of both, but a good feature to have is definitely the proper shape and design to make it easier for you to meditate or complete a yoga pose. Undoubtedly, there are a lot of meditation pillows to choose from that you might get confused on which one to get. Just remember that despite all the snazzy features, your ideal pillow should be one that fits your preference. Let us see if the Satori Buckwheat Meditation Pillow is the one for you. We are going to take a look at its features and also list down the pros and cons of using it. Further, we are going to take this review up a notch by comparing it to its biggest competition. Do you want to see how it fares? The biggest promise of this pillow is that you can sit upright, prevent backaches, avoid hunching, and of course, be comfortable while meditating. With this pillow, you do not have to worry about your posture; instead, you will be more focused on what you are doing. The cover of the Satori Buckwheat Meditation Pillow is made of 100% cotton which is great because it is a very breathable material. It is filled with buckwheat hulls that are an eco-friendly and a durable alternative to cotton fill. What is great about this fill is that it moves with you, so you get optimum comfort but also stability to maintain the proper poses. It has a zipper which is hidden conveniently so as not to mess with the overall look of the pillow. It is also available in the colors black, green, navy blue, and red. With that said, you can completely remove the cover so that you can wash it. You also do not have to worry about the fill inside because it has an inner cover. Additionally, it will be easier to take out some of the fill to adjust the firmness or softness of the pillow. More than that, it can also be used as a regular cushion, and its size is great for transporting it from one room to another. Transport is also made easier with its carrying handle. Lastly, the company offers a 100% satisfaction guarantee wherein they can replace your current pillow if you are not happy with it. The Satori Buckwheat Meditation Pillow cannot only be used for yoga and meditation but also regular sitting. It has the typical shape of a cushion pillow which is round, and it also comes in a variety of colors. This pillow will be perfect if you want to correct bad posture and also to have support while you are meditating so that you can focus more on what you are doing. Additionally, it is filled with buckwheat hulls, and the cover is made of cotton. With those two materials combined, you can expect a comfortable sitting position as it does not retain a lot of heat. Therefore, you will stay cool even if you are doing long yoga sessions. What is better is that you can adjust how firm or how soft it will be because you can take out the fill by way of the hidden zipper. Moreover, you can also wash the entire cover since an inner cover protects the fill. This also ensures that the fill will not easily go out if there are any holes. Let us now compare the Satori Buckwheat Meditation Pillow and the Peace Yoga Zafu Meditation Pillow Cushion. Similarity-wise, they are both filled with buckwheat hulls. As for the biggest difference, the one from Peace Yoga has a crescent shape. Of course, the difference in shape is not only about the aesthetics, but it also has something to do with its functionality. By having this shape, it can be used for different purposes like being used as a yoga block to put your feet closer. In this way, it can also relieve pressure on your legs. At the same time, the one from Peace Yoga is more lightweight. Using this pillow is more convenient than hulling around a heavier pillow like the one from Satori. In addition, there is also some focus on spine support, so it is not only about supporting your buttocks but also ensuring that you maintain a proper posture. With those added features, how will the Satori Buckwheat Meditation Pillow fare? Are its basic features enough to beat its biggest competitor? 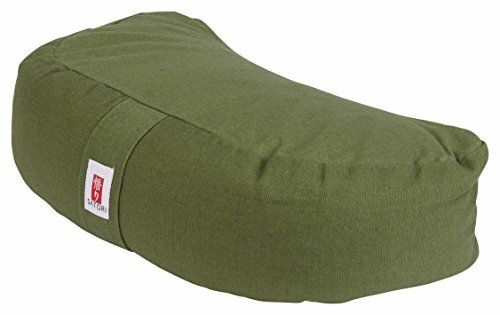 The better pillow is the Peace Yoga Zafu Meditation Pillow Cushion because it has some features that also help support focus and concentration while doing yoga and meditation. However, that does not necessarily mean that the Satori Buckwheat Meditation Pillow is a bad product. The truth is, were it not for the extra features of the one from Peace Yoga, the Satori pillow would have won. Honestly, the Satori Buckwheat Meditation Pillow is very close to the one from Peace Yoga in such a way that it is very comfortable and offers a considerable amount of support. Having said that, it is really great that it adjusts to the way the one who is sitting on it moves. This feature is actually both an advantage and a disadvantage. It is an advantage because you are sure that you will always be propped on something even though you extend your position. On the other hand, it is a disadvantage because most of the poses need you to be firmly in place. So, really, it all boils down to your preference and on what you are going to use the pillow. Both pillows are great, it is just that the one from Satori is a few features less than the Peace Yoga pillow.